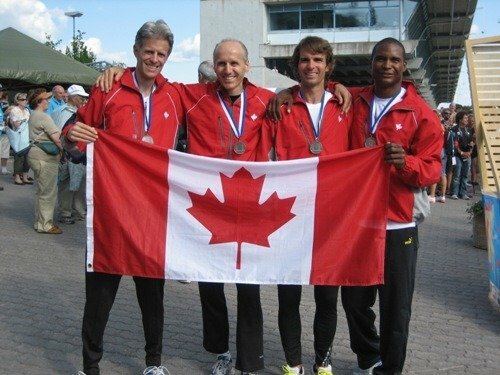 If these names sound familiar to you, it’s because they were part of the Canadian Masters 4x400m M40 relay team (along with Malik Crepsac and Mike Sherar) that set the National record back in 2007 which you can read in my 2007 WMA Riccione experience. Two years later in Lahti 2009 WMA, they set the 4×400 record again (YouTube video here), this time with Peter Lawson instead of Malik. Impressive when you consider 3 of them were 2 years older! A simplistic summary might state that 400m runners are lacking aerobic capacity, and that 800m runners are lacking speed. But the differences between runners of these two events are much more complicated. In fact, there is also an important cultural difference between 400m and 800m runners – far greater than between participants in any other two sequential events. The 400m is a sprint event. As such, most of the training for this race is anaerobic work, speed/power development, and technique. It is very rare for 400m runners to include steady runs in their training. The proportion of anaerobic to aerobic requirement for 400m runners is typically about 75%/25%. A runner’s top speed and ability to run relaxed close to his/her top speed are essential for good 400m performance. However, by definition, the 400m runner does not have to maintain that speed very long, so acquiring a great aerobic capacity is not very important for 400m runners. This is the reason why the 800m runners will usually beat the 400m runners in a 600m race. 800m runners also have to work on their speed, in order to run economically and minimize their level of effort during the first lap. But the 800m is a middle distance event. As such, the training for this event should involve a mix of aerobic and anaerobic work. Contrary to 400m runners, 800m runners have to include a lot of steady runs and VO2max sessions in their training, to develop the aerobic side. This is because the ability to reach the 600m point with the lowest level of lactate is key to winning an 800m race. This is what the 800m training should aim to do: Teach the runner’s cells to metabolize lactate. 400m to 800m repeats with short recovery time are a good way to achieve this. On the other hand, all-out sprinting is included only occasionally in 800m training. The proportion of anaerobic to aerobic requirement for 800m runners is typically about 60%/40%. To illustrate these differences, let’s compare examples of a May training week for a 47-second 400m and for a 1:48 800m runner (not including warm up and cool down). You can see right away the greater emphasis of the 400m training on speed and speed endurance; and the greater emphasis of the 800m training on aerobics and special endurance training. Very good analogy between the 400 and 800 and requirements of both, however; I’d like to point out that according to Clyde Hart and the latest research on anaerobic vs aerobic for the 400, they state that for the 400 it is more like 60-40 An to Ae. The 800 ratios are probably fine for a 1:48 half miler but as the duration of the event goes up the ratio changes, thus for masters it is probably more than 50% aerobic. @Patrick, thanks for the numbers! Interesting article-thank you Jimson and Chris. Gary makes a good point-recent research does suggest that sprinting uses more aerobic energy sources than was previously thought. Spenser and Gastin, 2001, (and replicated by others) estimated aerobic contributions of- 29% for 200m, 43% for 400m (66% for 800m). Your article is of particular interest to me as I am currently training for the 400 and 800 for the outdoor track season. My question to you (Chris and Paul), is how do you balance the training for both events and does it depend on your individual strengths/weaknesses and natural propensity for speed/power vs. aerobic capacity? It absolutely does depend on your strengths and weaknesses. Since you are running 400’s and 800’s you are probably coming from the speed end. I recommend working on improving your aerobics to achieve very significant improvements in your overall 800m times. At the same time you have to maintain your speed work to keep the strength of your 200m speed. The gains in your aerobics will also improve your 400m times as we know that there is a fairly significant aerobic component to the 400m race. If you focus solely on the aerobic end you will start to lose your speed and while your 800m times may get better in the short term you are likely to see your 400m times get slower and in the long run even your 800m times will probably get slower as you lose too much speed. latest 800- 2:28 2 weeks ago. Going to Senior Nationals in Cleveland in 12 weeks. ex: I’ve been doing 300’s-46-51. And long runs of 45-50mins. It’s so hard to train for both. Can you help me please with what I can do in the next 12 weeks. Can either of you respond with a program for me. Maybe split it- 6weeks 800 training 6 weeks for the 400. I want a medal in the 8. The 4 is icing on the cake. Thanks so much. Maybe you can send an e-mail with some help. Interesting article, yet again. 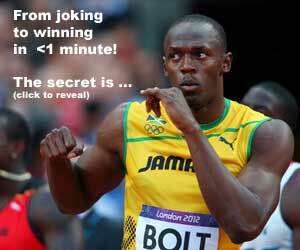 However, I couldn’t see how the sample 400m training had any examples of genuine speed or speed endurance sessions – i.e. top speed with full recovery. Everything was run off short recoveries, suggesting that it was more about lactic tolerance and running at sub-maximal speeds off incomplete recoveries. I’m confused, Jimson ;-) According to Khmel and Lester’s “Classification of Sprint Training Methods” there is zero speed or speed endurance work in those examples. Or have I missed the point?